This little guy surprised us – not due until a week after the new year, we were in for a bit of a shock as we found ourselves en route to the hospital three weeks early. Fortunately, we had just packed our bags for the hospital the night before, and in a sweet twist of irony, my wife finished sewing Levi's baby blanket just 15 minutes before we needed to leave. Fourteen hours later, in the middle of the night, our son was born… healthy and with a full head of dark hair. He was truly our early Christmas gift. Since his arrival, we've been holed away trying to outlast this record-breaking winter (something like 52 inches of snowfall this year). Working from home has allowed me more time to be with my family, and I've been cherishing every minute of it (except, of course, when we've got two screaming children to deal with). I recently got around to designing my son's birth announcement. After my daughter's announcement, I knew I couldn't slack on this one. I wanted to create another typemark, but this time with more of a masculine feel. I went with an industrial shape and weathered texture with type reminiscent of a baseball park scoreboard. For my daughter's, I had used a pearlescent specialty paper to print on, but I felt this design demanded a nice smooth, matte finish. After searching a few sites, I found the paper stock I was looking for and a good price at picaboo.com. The printing and overall quality were exceptional. 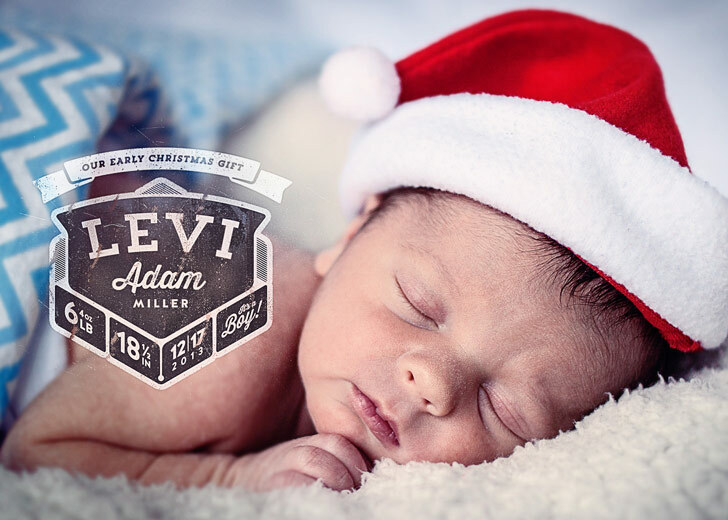 So without further ado, please welcome my son, Levi Adam Miller!